Have you ever been struck with a genius thought while in the shower? Maybe for you, it’s while you’re taking a leisurely walk, or playing with your kids or grandkids. Perhaps you came up with your newest product or service while doing something that had nothing to do with work at all? While visiting a client on a recent business trip to California, I experienced what Carson would describe as a creative “incubation period”. 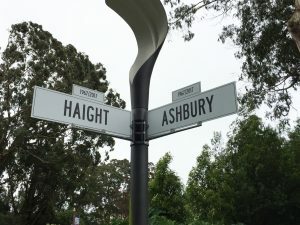 While walking through Golden Gate Park in San Francisco with my son, I began to notice artwork and other exhibits promoting the Summer of Love Experience in celebration of its 50th anniversary. As I walked, I noticed street signs comparing 1967 to 2017. This caused me to pause and reflect back, thinking about the original Summer of Love and the changes the world has seen over the course of 50 years. 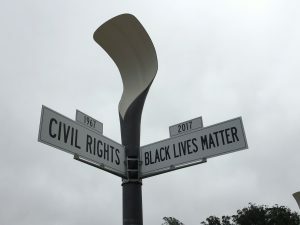 As I continued to read the street signs I started to notice a trend – though the specific group, community or cause changed over the years, the root of each of these causes remained the same. Social justice, equality, health care, connectivity, personal identity – all of these causes are just as important today as they were 50 years ago – they’re just known by new name. Or from a marketing perspective – they’ve been rebranded. Which upon reflection brought me back to where the company I founded, Linx, finds ourselves right now – in the middle of a rebranding of our own. We’re giving ourselves a facelift after 22 years in business, as the third generation of our family business begins to lead the company. Because of this and the timing of the Summer of Love experience, my creative incubation period shifted into hyper-drive. Re-branding your image forces you to really evaluate your brand and tests you to make sure you truly know what your company’s core values are and if they can stand the test of time. Companies with a strong foundation are the ones who last through generations because they recognize that while times change, the root of what your company stands for won’t. Before you even consider re-branding, the first thing you need to do is stop and evaluate your brand as it stands right now. As I mentioned, the foundational elements of your brand should never change. Look at companies that have stood the test of time – Pepsi, Apple, Target and Burberry for example – and take note of the fact that their core messaging never changes. For example, over the years Pepsi has acquired various additional brands, expanding their product line and changed their look – but their mission has remained the same. Pepsi purposed themselves to remain relevant with each upcoming generation with advertising campaigns that have evolved throughout the years – first with their Pepsi Generation campaign in 1963 followed by the sub-sequential “The Choice of the Next Generation” and “GenerationNext” campaigns. A successful brand stands for something fundamental – this bedrock principle must show up at every turn and with every product and service offered. Without strong emotional connections your brand won’t have any traction. Successful brand positioning rejects following the masses and conformity and stands out from the crowd. It stays the same while simultaneously evolving with the changing cultural tide over time. At Linx, we’ve been changing the way organizations see the world… and how the world sees them for the past 20 years. But today we’re simplifying our value by helping companies… “Think Ahead™ ”. We recognize that change is guaranteed, which means we need to help our clients stay ahead of it. Typically, a new technology or product is introduced and people are forced to waste valuable time playing catch up to learn how to optimize that change within their company. By default they follow a formula where change drives learning. We have discovered however, that learning must be done at a pace equal to or greater than the rate of change. In other words L≥C. This allows for faster adoption of change and accelerated growth opportunities. 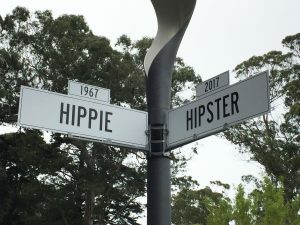 Back to Haight Ashbury. As we are processing through our own rebranding, encountering the Summer of Love Experience forced me to ask myself what the world was going to look like 50 years from now? Surely social justice, equality, affordable health care, connectivity and personal identity would be just as relevant as it is today, but by what parameters? What challenges will we be facing regarding healthcare or social justice? Who or what will be the new hipster? Is it a word that we’ve even created yet? What about equality or civil rights? With the rise of AI technology, will we find ourselves petitioning for equal rights for them, or will it be for someone or something entirely different? We may not know these answers yet, but I feel it is our responsibility to begin considering them. Many companies put their trust in us to recognize the upcoming shifts in the market and anticipate new trends before they happen. Which means as a strategic marketing agency – our team must be ready to usher in these changes. So we decided to ask the question. What will these signs say 50 years from now? We want to hear from the masses. So this summer in honor of the Summer of Love, we will be surveying people across the country asking them this very question. Please participate in our survey… pass it around and share it and we’ll report back out on the top choices society envisions the world will look like in 2067. As you and your team begin to ponder how to ensure the relevance of your brand in the near and distant future, remember that the team that stays ahead of change is most able to help you see the future as it will most likely occur, giving you and your company new and significant grow strategies to meet the needs of your customers today… and tomorrow!